The Chicago Housing Authority (CHA) and executives of The Michaels Organization, along with 27th Ward Ald. Walter Burnett, 3rd Ward Ald. Pat Dowell and 28th Ward Ald. 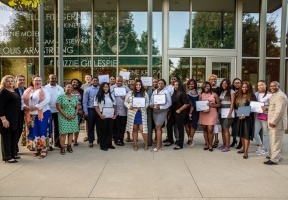 Jason Ervin, celebrated 15 CHA residents and Housing Choice Voucher (HCV) participants at Savoy Square Wednesday who were part of 27 public housing college scholarship recipients from The Michaels Organization Educational Foundation. The Michaels Organization Educational Foundation is a non-profit affiliate of The Michaels Organization, the private sector partner of CHA on the development and management of Park Douglas, Legends South, and Westhaven Park – all former public housing communities now transformed into modern, sustainable affordable housing. In total, the Foundation awarded more than $750,000 in college scholarships to public housing residents Wednesday.